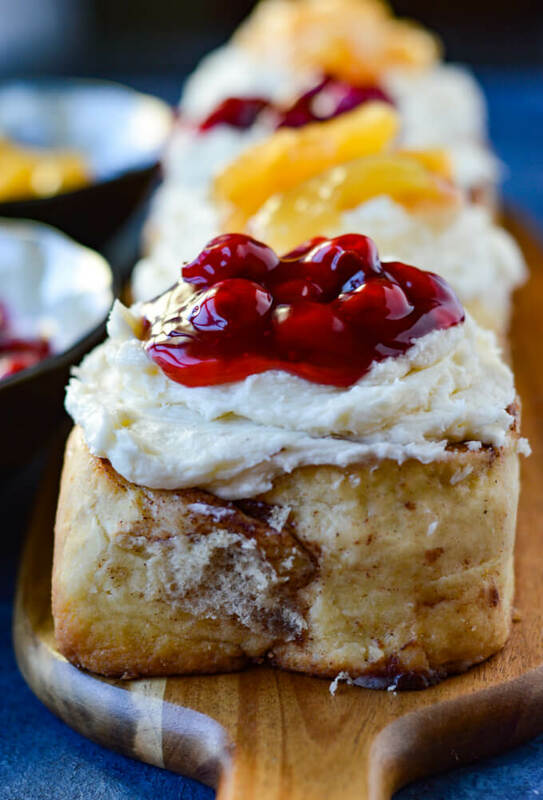 These Homemade Cinnamon Rolls are loaded with a tremendous amount of butter, cinnamon, and sugar that oozes with goodness. A buttery cream cheese icing melts into all its crevices. To top it all off, add a dollop of cherry and/or apple filling. And there you have it – scrumpdillyicious!! Mmmmmmm! There is aromatherapy happening in my kitchen right now. The scent of cinnamon and rising yeast are mingling with anticipation and permeating my senses. I only have about 12 minutes before I grab a hot pad and pull a luscious pan of Homemade Cinnamon Rolls out of my oven. I’m amazed at how something so simple can bring such joy to my life! And of course, I add a cup of coffee to this picture and my day is set for greatness! These cinnamon rolls start with my Homemade Bread Recipe. 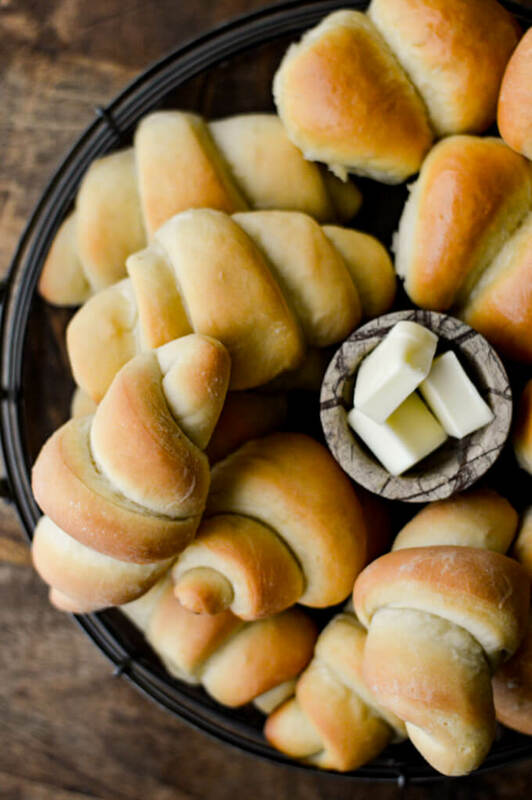 I’m not sure where it originated but I do remember both my mom and grandma making bread and cinnamon rolls with this recipe hundreds of times. 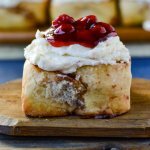 They passed the tradition on to me and whether I’m forming the dough into crescent rolls, clover leaves, knots, or these cinnamon rolls, this recipe always turns out perfect. 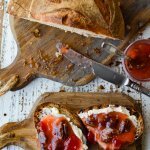 I have step by step instructions for the bread dough on this post if you want to jump over there and check it out. Once the bread dough has risen one time, punch it down and roll it out on a floured surface to a 24×12 inch rectangle. This is where it gets good! 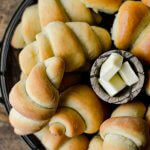 Spread softened butter all over the surface of the rolled out dough. Sprinkle tons of cinnamon and sugar, then let the fun begin. 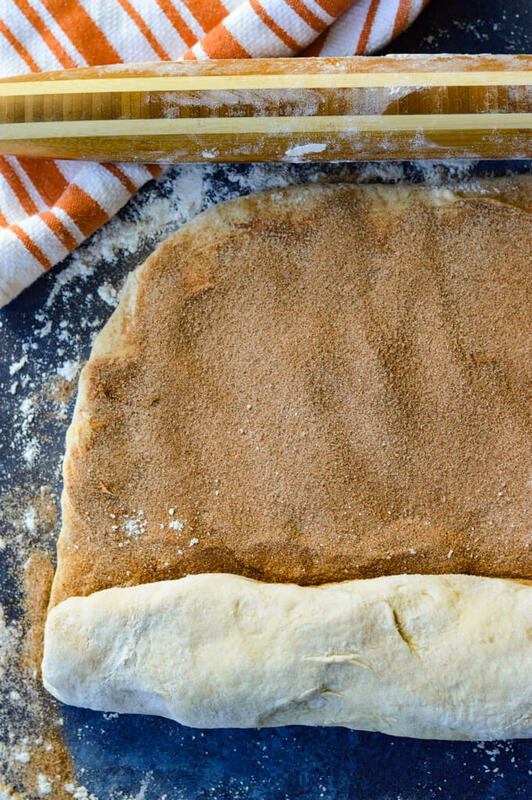 Starting at the widest side (24-inch side) of the dough, tug the lip up over the cinnamon and sugar, then begin rolling, moving from left to right and tightening the log as you go. Finish with the seam side down. Gently squeeze back and forth across the dough in order to get a consistent thickness. With a serrated knife, slice the dough with a back and forth sawing motion. Wipe the knife with a moistened towel after each slice. Depending on how thick you like your cinnamon rolls, cut the slices either 1 1/2 inches or 2 inches apart. I like mine extra thick so I always go 2 inches. Generously butter two 9×13-inch cake pans and place 6 rolls into each pan. Tuck the ends slightly under each cinnamon roll. Cover with a dish towel and set in a warm place (the top of a heated oven works great). Let rise for about one hour, until they are doubled in size. Another option is to cover the pans with plastic wrap and set in the fridge overnight. The next morning, pull them out and let them rise in a warm place until doubled in size. Once they have doubled in size, place the pans in a 375°F oven and bake for 30-35 minutes or until golden brown. You can test their doneness by using a fork and pull up at the center of one cinnamon roll to see if they are still doughy or not. If so, put them back into the oven for another 5-10 minutes. The “icing on the cake” is definitely the buttery cream cheese icing that I whip up right before it comes out of the oven. And, by the way, it’s so simple. Beat cream cheese, softened butter, vanilla and a little bit of whole milk until it is nice and fluffy. To change things up a bit from a basic cinnamon roll, I make a well in the icing and add a dollop of pie filling to the top of each cinnamon roll. 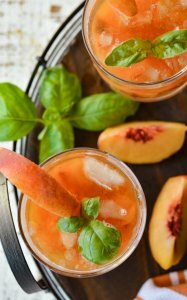 It adds a nice bit of color, some extra texture, but mostly it brings in an additional layer of flavor. And I’m all about layers of flavor. 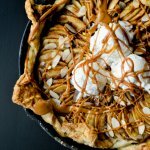 The best way to fully enjoy something right out of the oven is to incorporate all your senses. The smell. The taste. The texture. They all add up to a tantalizing experience. 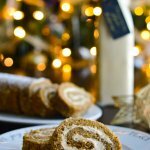 And what better experience than sinking your teeth into swirls of cinnamon and sugar puffed goodness that has been slathered with sweet creamy icing. Now that’s what I call pure delight. 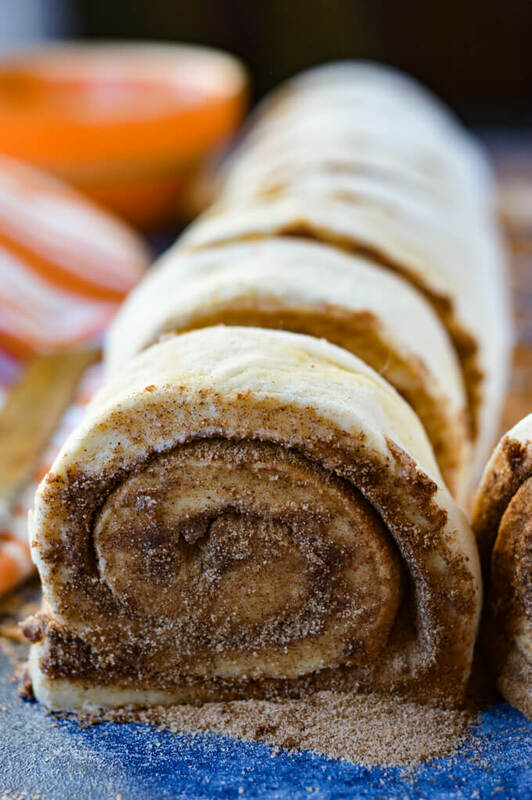 If you love these Cinnamon Rolls, you will love my Homemade Bread Roll Recipe. 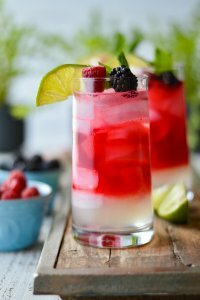 Click here or on the photo below and get the recipe. 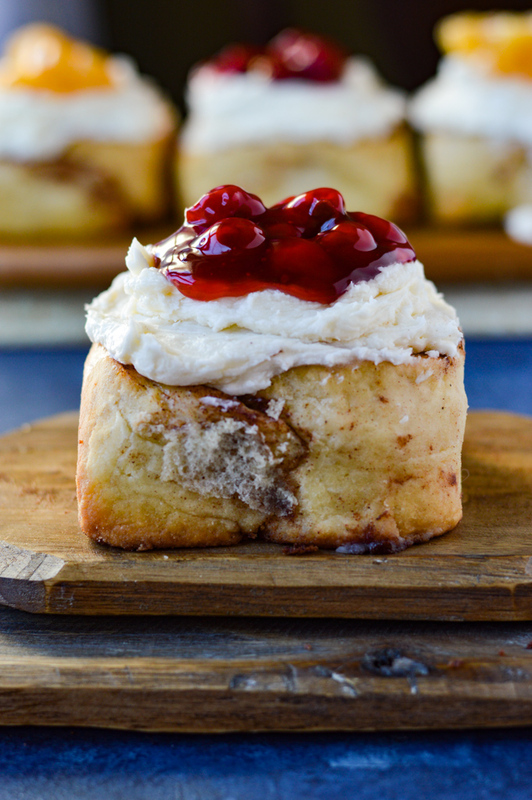 These cinnamon rolls start with a bread recipe that has been in my family for generations and it never fails. Add lots of butter, cinnamon, and sugar for the filling. A buttery cream cheese icing melts into the crevices. Top them with cherry and apple pie filling. In a large bowl, combine sugar, shortening, salt and boiling water. Stir until dissolved. 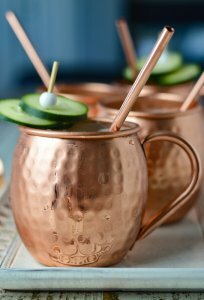 Set aside and let cool to room temperature. In a small bowl, combine yeast, 1 tablespoon sugar, and 1 cup warm water (110-115°F). Stir until dissolved. Set in a warm place (a microwave works great) for at least 10 minutes until the yeast has risen and the foam is doubled in size. Add the beaten eggs and yeast mixture into the melted shortening mixture. Make sure the shortening mixture has cooled to room temperature. If it is too hot it can kill the yeast. 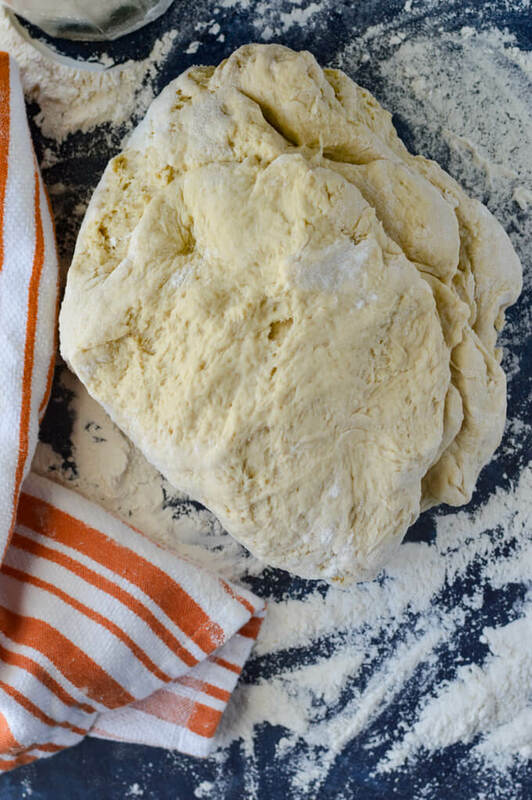 Place the dough on a floured surface and knead for 8-10 minutes. Continue adding flour to the surface as necessary when the dough becomes sticky again. You can tell by the feel of the dough when it is ready – it will start to feel dense and firm but not dry. 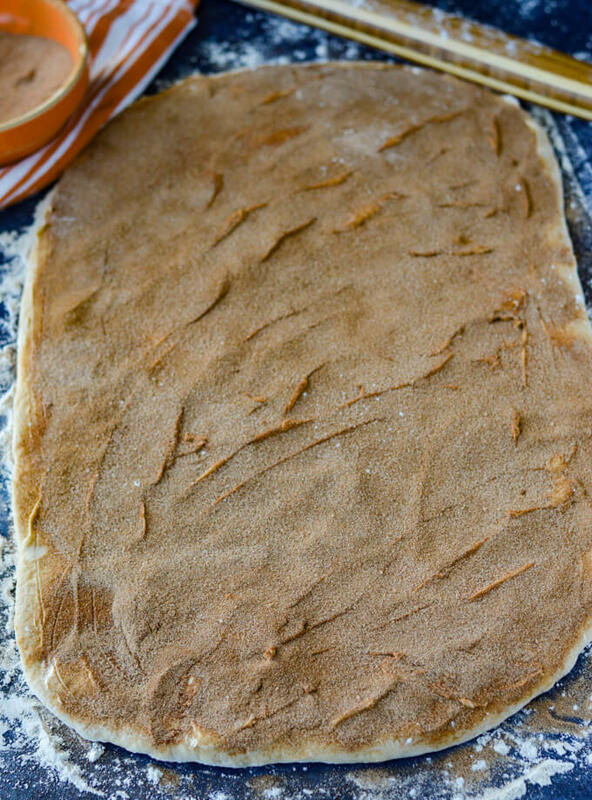 Punch down the dough and on a floured surface roll out the dough to a rectangle of 24×12 inches. Spread the 3 sticks of softened butter onto the dough. Generously sprinkle the sugar and cinnamon. Roll from the 24-inch side and finish with the seam down. I gently squeeze back and forth across the dough in order the get consistent thickness. Slice the dough with a serrated knife in 2-inch sections (I like my cinnamon rolls thick). Makes 12 large cinnamon rolls. If you want to have more, cut the sections into 1 or 1 1/2 inches. Place 6 rolls each on two generously buttered 9×13-inch cake pans. Cover with a dish towel and set in a warm area. Let rise for another hour. Preheat the oven to 375° F. Bake the cinnamon rolls until golden brown, for approximately 25-30 minutes depending on their thickness. While the rolls are baking, prepare the frosting. Remove the cinnamon rolls from the oven. Let sit for 10 minutes. While they are still warm, ice with the cream cheese icing. Make a little well in the top of the icing and add your favorite pie filling. 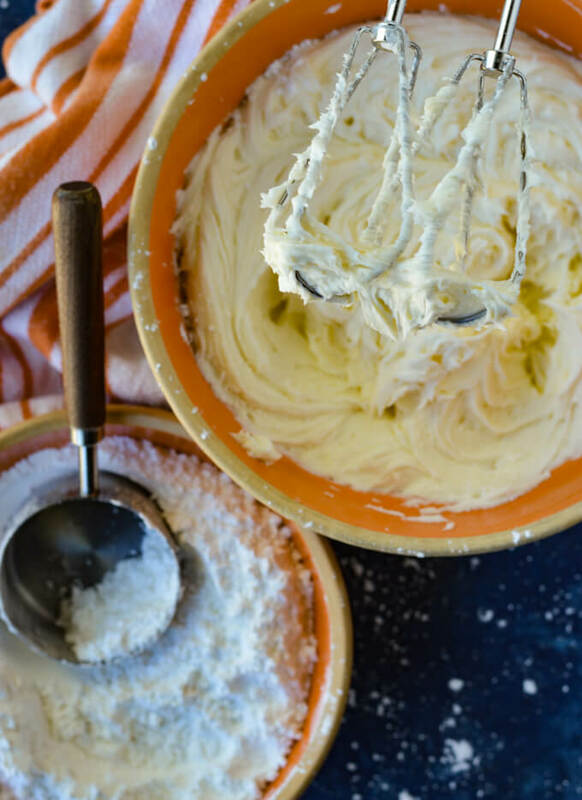 Cream together with a hand mixer the butter and cream cheese. Add 1/2 the powder sugar and continue mixing until combined. Add the remaining powder sugar, 1-2 tablespoons of milk, vanilla and a pinch of salt. Continue beating and adding extra milk to the desired consistency. Beat until light and fluffy. 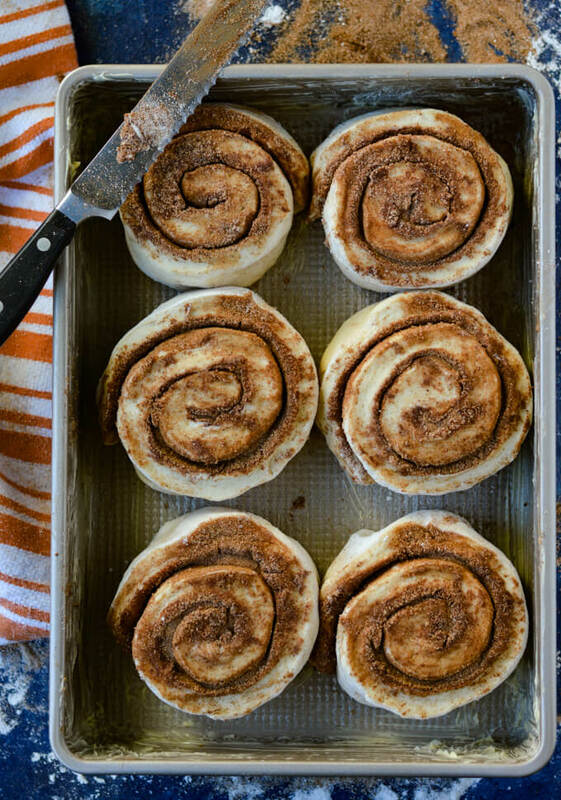 This makes more than enough frosting for this batch of cinnamon rolls. You can freeze whatever icing is left over. With a serrated knife, slice the dough with a back and forth sawing motion. Wipe the knife with a moistened towel after each slice. A Make-Ahead Option: Cover the pan of cinnamon rolls that have not risen yet with plastic wrap and set in the fridge overnight. The next morning, pull them out and let them rise in a warm place until doubled in size. Test their doneness by using a fork and pull up at the center of one cinnamon roll to see if they are still doughy or not. If so, put them back into the oven for another 5-10 minutes. 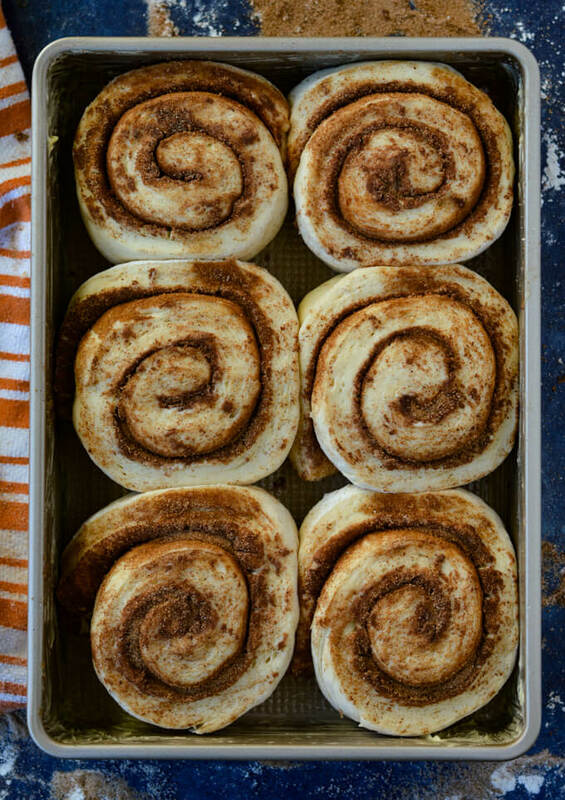 Let the baked cinnamon rolls sit for about 10 minutes before you ice them. You want them to still be warm though so some of the icing can seep down into the crevices. To change things up a bit from a basic cinnamon roll, I make a well in the icing and add a dollop of pie filling to the top of each cinnamon roll. Amazing! You truly can taste the love in each bite. Awww – Thanks so much Rene’. There is definitely a heartfelt love at the center of these cinnamon rolls. And of course, cinnamon and sugar. 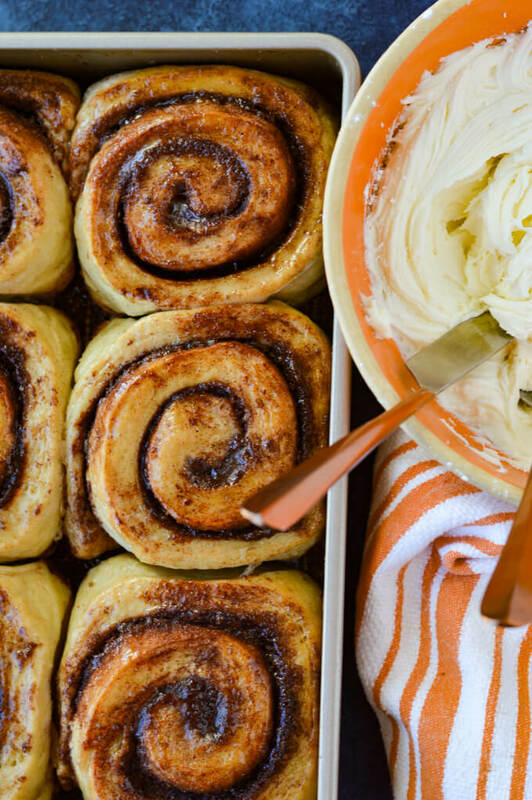 Cinnamon Rolls are the ultimate comfort food! And these look fantastic!